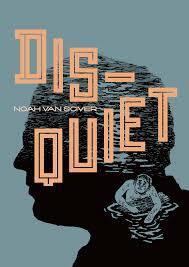 Disquiet, by Noah Van Sciver. This is an elegant collection of short stories culled from his own Blammo! series, various anthologies, short one-shots, illustrations and features made just for this book. Designer Keeli McCarthy outdid herself working with Van Sciver, as every aspect of this book is simply beautiful. The quality of the work itself varies, as it's a mix of his better and more recent stories as well as some sillier but still interesting material. That said, Van Sciver does a great job, working with editor Eric Reynolds, of sequencing the stories and interspersing them with interesting interstitial material. The most striking of this sort of material was a series of silhouette head shots of Van Sciver, each one a more fantastic rendering of what's really going on inside of his head: a lush forest, a series of lightning bolts, a rugged farm, a desolate and wind-swept cityscape, a mountain fortress filled with soldiers, and a strange contraption. In many respects, these illustrations and others are a sort of career mile-marker for Van Sciver, demonstrating the ways in which his drawing skills have improved. 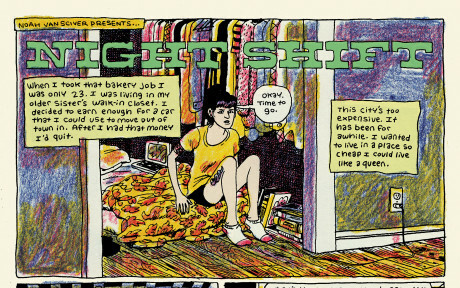 Van Sciver has always favored a detail-rich approach to his comics, which made his early comics feel cluttered and messy. Usually, most cartoonists learning on the job figure out they need to simplify and stop over-drawing. Being a cartoonist doesn't mean you need to make every image a representational triumph; instead, what's important is the clarity of the storytelling. Counterintuitively, Van Sciver took the harder road: improving his skill as a draftsman through patience and practice, and then applying what he learned to his storytelling. The story, "The Death Of Elijah Lovejoy" (originally published by 2dcloud), is an example of that kind of learning lab. His first book, The Hypo, saw Van Sciver make a big jump with regard to both storytelling and techniques like his hatching and crosshatching. This story, a sort of companion piece to The Hypo, was essentially a series of drawing problems that Van Sciver tried to solve on every page, as a lynch mob that had killed a black man was now setting their sights on an abolitionist newspaper and its printing press. The story is the greatly outnumbered writers trying to defend themselves at sunset. So Van Sciver balances the colors in the sky against a densely-rendered house, horrific acts of violence on nearly every page, and the grotesquely-rendered participants. He uses a dizzying array of page design techniques, carving up panels at weird angles in order to keep the reader off-balance and fully inserted into the chaos of the event. Most of the stories in the book combine Van Sciver's expertise in depicting the lives of the abjected, the desperate, the doomed and the delusional with his fascination with twists in the vein of E.C. Comics or The Twilight Zone. "The Lizard Laughed", for example (based in part on Van Sciver's father), is about a man whose son contacts him years after he walked out on his family. Here, Van Sciver uses a false climax (the son confronting the father, only to be brushed off) to set up a darker one (where the son weighs the decision of whether or not to kill his father in his sleep with a gun he had brought with him for just that purpose). The story works because of Van Sciver's unerring ability to balance the mundane aspects of his characters' lives with the unusual thing that happens in each story. "The Cow's Head" is a grimy fairy tale that's true to the unsanitized tradition of violence and punishment inherent in such stories but that's also given a level of absurdity true to Van Sciver's sense of humor. "Down In A Hole" is about a suicidal clown who's been fired from his TV show who falls into a deep hole while exploring a cave, finding a tyrannical society of mole men living below. The final twist, after what appeared to be a heroic escape, makes perfect sense as he realizes he has to accept his punishment. That urge to escape, a thirst for justice or a desire to go back to a simpler time is present in every story in the collection, and Van Sciver rarely grants his characters what they want. 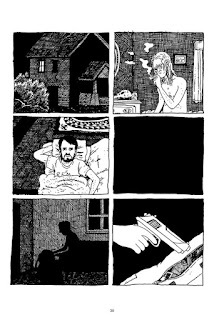 "Punks V. Lizards" represents a merger of Van Sciver's older interests as a cartoonist with his new understanding of how to emotionally modulate a story. Indeed, it's a perfect example of a character wanting to go back to a simpler time when they were happier with other people. "Night Shift" and "Untitled" find Van Sciver experimenting with making women the protagonists of his stories, often in roles that are compelling but also juxtaposed against more colorful characters with far greater problems. Overall, the material in this book is a step above his first collection, Youth Is Wasted. Everything is sharper, smarter, better drawn, more complex and more interesting. Before Van Sciver won his Ignatz, I told him and anyone else who would listen that Van Sciver has had a good an eighteen months as any cartoonist in the world, based on this collection, My Hot Date, Fanta Bukowski and other work. What is obvious, and is evident by my review of tomorrow's entry, is that Van Sciver hasn't come close to peaking yet.